UN Secretary General Ban Ki-moon has highly acclaimed Prime Minister Sheikh Hasina for her commendable role and strong leadership for strengthening democracy, achieving social uplift and the UN set MDG goal-4. “You are the champion of democracy. Your prudent leadership and commitment to people’s welfare would help achieve the UN set all Millennium Development Goals (MDGs) in Bangladesh soon,” he said. The UN Secretary General said this as the Bangladesh premier held a meeting with him at the UN building here yesterday afternoon (local time). Earlier, the Prime Minister passed a hectic day as she was interviewed by the News Week, BBC and Voice of America (VOA). 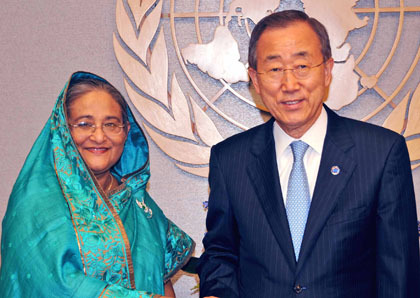 Ban Ki-moon also appreciated Prime Minister Sheikh Hasina’s strong leadership in the last COP-15 in Copenhagen for the Least Developed Countries (LDCs) and Bangladesh’s preparedness in tackling adverse impact of global climate change. Congratulating Sheikh Hasina for securing the MDG award by the UN in recognition of achieving the MDG goal-4, the UN Secretary General expressed the hope that Bangladesh would be able to achieve the rest of the goals in future under her prudent leadership. Mr. Ban Ki-moon also lauded the role of Bangladeshi peacekeepers in the UN peace-keeping missions and said that the UN is closely monitoring the development of Bangladesh and he assured of the UN support for its development endeavors. During the meeting, Sheikh Hasina lauded the UN Secretary General for his sincere and relentless efforts in making the UN a more dynamic and functional institutions saying, “You undertook a number of reform initiatives that reflected your openness to new and innovative ideas”. The Prime Minister reiterated her call to the UN Secretary General to appoint Bangladeshi peacekeepers to the policy making and administrative bodies of the Department of Peace Keeping Operations (DPKO) as a largest troops contributing country. Regarding achieving the MDG award in recognition of reducing child mortality rate in Bangladesh, she informed the UN Secretary General that Bangladesh is at the threshold of achieving at least three MDGs soon. MAULANA A K M YOUSUF, village-Rajoir, Thana-Saran Khola, District-Bagerhat. Presently he is the acting Ameer of the Jamaat-e-Islami Bangladesh. He was one of the leading anti-liberation organizers during the 1971 war. As part of his role in the anti-liberation activities he became a member of Malek cabinet during the war. After the liberation war AKM Yusuf was arrested on charge of collaborating with Pakistan army and sentenced with many other members of Malek cabinet. He first formed ‘Razakar Bahini’ comprising 96 members of Jamaat-e-Islami in Khulna district. He became the leader of the Jamaat well before the freedom War started. He started his anti-Bangladesh role and cooperating the Pakistani forces as soon as the war began on March 25. His responsibilities were to issue statement, organize the anti-liberation forces and lead attacks, killing, looting and arson by his groups. He also helped the members of the Pakistani forces to do the same. His statements published in the newspapers where he opposed the liberation war and urged the collaborators to resist the pro-liberation forces. On October 10, 1971, this anti-liberation leader praised activities of the Razakars in a public rally and said, “we will have to make the people understand that the so-called Bangladesh concept is created by Indian authorities is valueless. Naxalaits, separatists and criminals are trying to create anarchy in this part of the country. They should be ousted by root.” (Genocide ’71, Muktijuddha Chetana Bikish Kendra, Dhaka, February 1987). On October 26, at a gathering in Sylhet, he said, “a section of ignorant youths inspired by Indian propaganda has been unleashing separatist activities on our land. You spread over every nook and corner of the country to resist this movement and uproot the concept of so-called Bengali nationalism”. He warned the allied forces saying, “Had there been any war imposed on them, then heroes of Razakar and soldiers would face with all courage.” On November 12, 1971, he praised the Razakar activities while visiting Razakar camps in Shatkhira. He commented, “the Razakars have been doing their best to resist the spies and intruders of India”. He also assured the Razakars that he would provide them with government jobs. Guljan Bibi, a mother of martyr Shahid Seikh, informed that one Razakar Khaleq Member asked her son to join in the Razakar Bahini during the monsoon of freedom War. As Shahid rejected his proposal, the member called him out a month after. On the same day she learnt that her son was handed to the Pakistani forces. Later she rushed to the founder of the Razakar force, Maolana A K M Yousuf and requested him to free his son. At that time Khaleq Member was also with Yousuf who turned down her request. Guljan Bibi did not get her son back, later she came to learn that Pakistanis killed her son. Guljan demanded trial of her son’s killing. Yousuf along with his associates Khaleque and Adam Ali had killed number of males and females during the war. They raped many women. These information were disclosed by the citizens of Khulna, but still after 24 years of independence they are tight lipped for the sake of their own security. One of them told the commission that Yousuf forced many people from his own area Morelganj to join in the Razakar force. He forced them to work against the liberation war. Yousuf’s headquarters was the then ‘Ghost House’ which is now being used as district Anasr camp. This camp was the prime torture centre. Apart from this they used to torture the freedom-loving people at Khulna Shipyard, Bhashani Biddalaya and many other camps. They also killed people at such places wherever they felt comfortable. They handed over the innocent Bengalis to Pakistani Army stationed at the prime camp Circuit House, and other makeshift camps at Helipad, Naval base, hotel Shahin, Asiana Hotel etc. The Razakar and other fundamentalist forces maintained regular connection with the camps. They used to kill the people at Gallamari, forest Ghat, Station road and some other places. Australia, a staunch U.S. ally and one of the first countries to commit troops to the war in Iraq five years ago, ended combat operations there Sunday. Soldiers lowered the Australian flag that had flown over Camp Terendak in the southern Iraqi city of Talil. The combat troops were expected to return to Australia over the next few weeks, with the first of them arriving home Sunday. The move fulfills a campaign promise by Prime Minister Kevin Rudd, who was swept into office in November largely on the promise that he would bring home the country’s 550 combat troops by the middle of 2008. Rudd has said the Iraq deployment made Australia more of a target for terrorism. Rudd’s predecessor, former Prime Minister John Howard, said he was “baffled” by the decision to withdraw the troops. “If I had been returned at the last election we would not have been bringing (troops) home, we would have been looking at transitioning them from their soon-to-be terminated role to a training role,” Howard told the Sydney Morning Herald in an interview published Monday. Howard, who led the country for 11 years and celebrated his friendship with President Bush, told the newspaper that the decision to send Australian troops to Iraq in 2003 was “very, very, very hard.” But he stood by his choice, which he said helped further deepen Australia’s alliance with the United States. Australian troops helped train 33,000 Iraqi army soldiers following the overthrow of Saddam Hussein. They helped train the Iraqis in logistics management, combat service support and counterinsurgency operations. Defense Minister Joel Fitzgibbon declared the mission a success, saying it had allowed Iraq’s own security forces to successfully take control. “Our soldiers have worked tirelessly to ensure that local people in southern Iraq have the best possible chance to move on from their suffering under Saddam’s regime and, as a government we are extremely proud of their service,” Fitzgibbon said in a statement Sunday. “The Australian contribution to the Iraqi army’s Counter Insurgency Academy is one of the lasting legacies of our commitment,” he said. About 300 troops will remain inside Iraq for logistical and air surveillance duties, as well as guarding Australian diplomats and others in Baghdad. A further 500 soldiers will remain in the region, including 200 sailors aboard the frigate HMAS Stuart in the Persian Gulf. Australia also will leave behind two maritime surveillance aircraft. Prof. Golam Azam, former Aamir of Jamaat, is certainly an educated person, and arguably one of most intelligent persons in the politics of Bangladesh. I hear he has a son in the nation’s army. Likewise many Jamaati leaders have placed their children in the cadet colleges with a view to packing the Military of future Bangladesh with Jamaat-minded Fascists. Do we want a fascist country? Should we not be pondering that question and the consequences if, by all the signs and symptoms, it looks like we are on a headlong journey towards that goal? Dhaka, May 27 (bdnews24.com) – The Awami League on Tuesday decided not to join government dialogue without party chief Sheikh Hasina, a move likely to put a question mark on ongoing political talks.The decision on boycott came from a meeting of the Awami League Central Working Committee at the party’s Dhanmondi office.The ALCWC meeting has been adjourned until Wednesday, acting AL president Zillur Rahman told reporters.A major announcement about a movement for the release of the former prime minister, now behind bars on charges of corruption, is expected to come from Wednesday’s meeting. The ALCWC meeting also endorsed most recommendations made by district AL leaders at the party’s crucial extended meeting on Monday. “The meeting has approved the speeches of the district leaders, showing honour to them. The district leaders said there would be no dialogue and no election without Sheikh Hasina,” Zillur said. “We have also decided that we will not go to dialogue without Sheikh Hasina. If we go to dialogue we will do so under her leadership. And it is Sheikh Hasina who will name those who will participate in it,” he said. The ALCWC meeting will resume at 11am Wednesday.